1. Heuristics (and Biases) Evaluation - This is a nod to the all more famous Heuristics Evaluation, but instead of using the list set forth by Nielsen, we use a list of the most common and powerful cognitive biases and heuristics that affect human decision-making. This allows us to review any type of user flow (on-boarding process, email campaigns, etc.) and identify the biases and heuristics that purvey the content. Identify content that invokes biases and heuristics that either negatively or positively impact the targeted behavior. Provides concrete design suggestions for avoiding/promoting these biases and heuristics. 2. Literature review - Yes, I know, this is hardly novel for anyone who comes from academia, but it is surprisingly underutilized in user research. Furthermore, there are ways of conducting the literature review to narrow in on the correct psychological principals and terminology for the specific behavior that we hope to change. Understand what we do and don't know about the interactions between the persona, environment, and targeted behaviors. Determine which behavioral change theory is best fit for this persona, environment, and particular behavior change we wish to positively motivate. 3. Applying Behavioral Change Theories - Once we have a sense of which behavioral change theories might apply to our persona, their environment, and the targeted behavior, we can test whether they actually do. I'll need to dedicate another post to describing the various methods we can use to do this. The cool part is that once we have an idea of which theory we would like to apply, we can begin translating this theory into an actionable design framework. Design with a focus on the persona and the behaviors we hope to motivate. Design based off of a framework that is substantiated through decades worth of peer-reviewed knowledge. If you liked this, free to download and share. One of the easiest ways to promote higher consumption of healthier foods is to increase the visibility, or salience, of those foods. Placing vegetables under brighter lights and in easy to reach locations along a school buffet line leads children to eat more of those healthy items and less of the cookies placed in the dark obscure locations. Putting fruit in a fruit bowl and cookies in the cupboard at home produces a similar effect. The salience of fruits and vegetables can often lead to a meaningful increase in their consumption. Since Manavs are everywhere it means that I always have a second chance to buy what I wanted. Sometimes I stop at a store and think, that'd be nice to buy, but then I leave empty handed because I decide I don't need it at the moment or I'm late to see a friend. But here, I see it again just 60 seconds later. This time, I choose to buy it. Manavs are situated along the sidewalk. I don't have to go inside and waste unnecessary time which means there is one less barrier between me and my fruit. 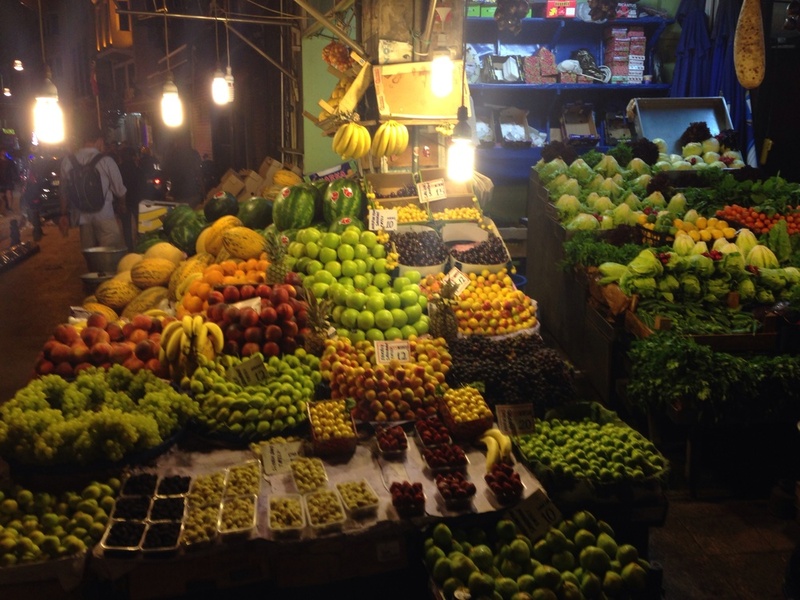 Manavs are well lit at night, making them beacons of fresh fruits and vegetables. They appear glorified with brilliant hues as if they were the finest candy around. And of course, what is well lit is easier to see and therefore purchase. Like I said, Manavs stay open really late. And they deliver. That is what those numbers on the top of their signs are for. If I want a snack at 11pm, I just call up my local Manav and they will run it over at no extra cost for the delivery. Another barrier to eating delicious fruit removed. It's cheap. What would cost $20 usd in Boston is worth $2 usd in Istanbul. And that is not just because of the conversion rate. It's cheap for locals as well. Where a beer costs them about 6 lira, a kilo of cherries cost 4 lira, a clearly better value. Of course the system is not perfect. Farmers are forced into selling their produce rapidly at cheap prices due to a rush caused by the insurmountable debts imposed on them by the government. The fruit and vegetable vendors exploit the situation by haggling the farmers even lower and then turn around to make the profits in the city. The constant grind of human rights ebbs on as farmers begin to rally together. The next few years for farmers in Turkey may be something to watch as this may effect how these Manavs function and subsequently people's eating behaviors. For the time being, however, fruits and vegetables are being eaten like candy. This is one of my favorite meals thus far. 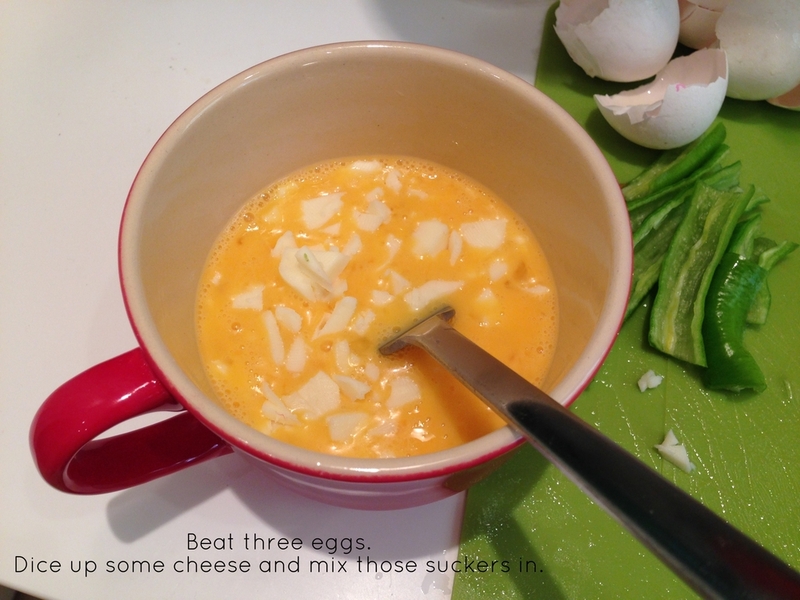 It shares a lot of similarities with Israel's Shakshouka, but it's superior in my opinion because it's not as strong. Shakshouka is heavier on the garlic, onion, tomato and salt (which are all great things), but it's better suited for a dinner than a relaxed breakfast. 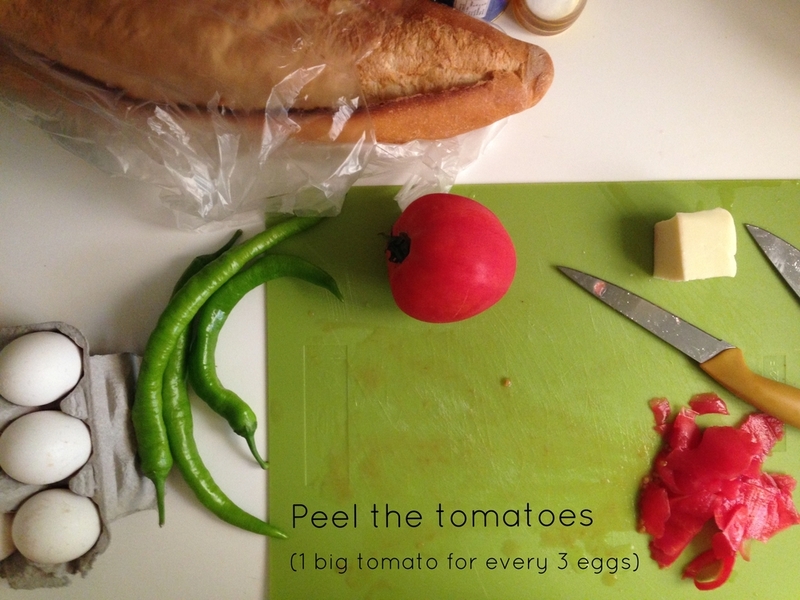 Menemen, on the other hand, is filled with delicious light flavors which can calmly fill the belly on mostly vegetables. 2. Kids drive their motor scooters on the sidewalk. It's terrifying for so many reasons. Also bicycles share the sidewalks in Tel Aviv. From a bicyclist's perspective it's the safest thing to do. From my perspective it's another reason not to text and walk. 3. Some people are really aggressive at first and then warm up later. We had a cab driver who tried to charge us extra for our bags after we had already agreed on the price. Angry banter pursued and ended with him tersely accepting the original price we agreed on. He then immediately switched moods and started sharing stories about his grandchildren. Many of our Israeli friends confirmed these observations. One friend said, "people here don't hold their anger inside, instead they get it out quickly and perhaps that's why they calm down so quickly". Needless to say, it seems plausible that people don't have as much of a problem with grudges here. 4. This is one of my favorites. At aroma cafe, the Starbucks of Israel, they wrap and package the halves of sandwiches separately. Sure this is wasteful but the default portion size is cut in half. My guess is that this makes it easier to stop eating when people are full rather than mindlessly finishing the whole meal. It worked on me. That being said I don't think it's intentional but it sure would make for a good study for Brian Wansink. 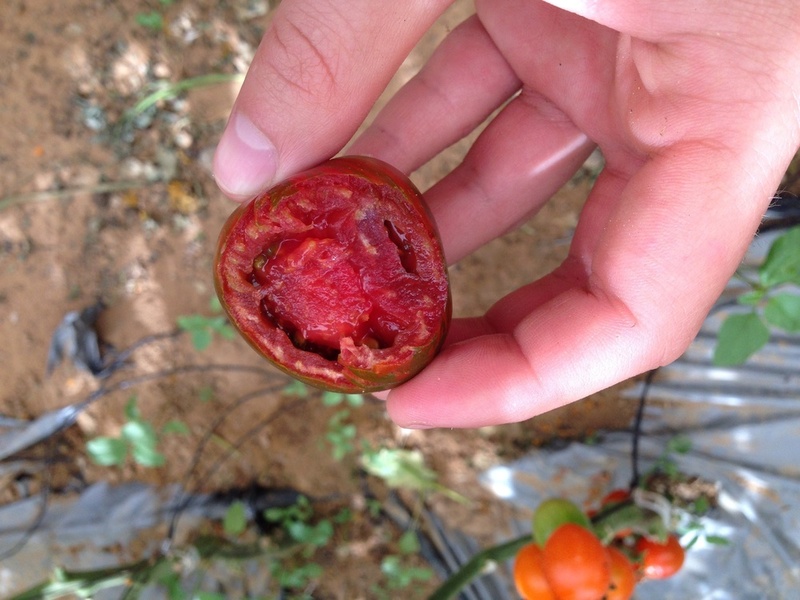 The tomatoes in Israel are unlike any I have tried before. Maybe it's because I just didn't pay that close attention in my earlier adventures, maybe they are completely new varieties. 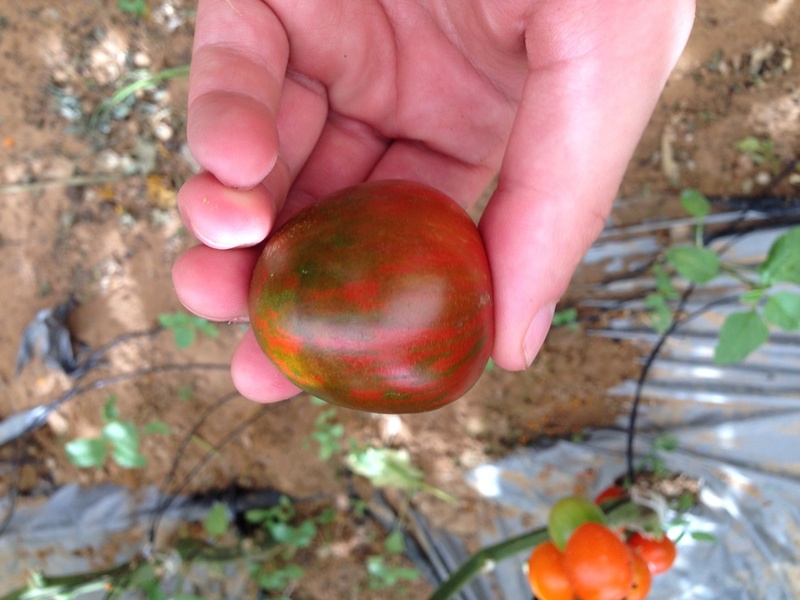 Regardless, the variety of flavors and textures that we were exposed to at a green house / hydroponic farm near the boarder of Lebanon were just awesome. Mmmmmm the skin was relatively tough compared to the yellow pair shaped ones, the ovular orange ones, and the bright red ones. It was not as sweet but it punched a really powerful vine flavor which gave it al almost spicy effect. The greatest part is that this variety was not only present on the farms but in all of the markets. Tomatoes are clearly a central ingredient to many dishes here. I wonder if the appreciation for this fruit stems from historically having a large variety of tomatoes or if this large variety exists because there is already a cultural appreciation for fruits and vegetables.